If calcium and magnesium are the Lady Gaga and Bradley Cooper of the mineral world, think of zinc as their killer backing band in A Star is Born. In other words, although this nutrient isn’t usually front-and-center in the spotlight, our bodies’ performance wouldn’t be nearly as harmonious without it. See, zinc is one of 16 essential minerals that we need to survive. Yet it’s considered a trace mineral, meaning we only need small amounts of it. Perhaps that’s why we don’t hear as much about it as we do major minerals—including iron, sodium, potassium, and, yes, calcium and magnesium—which our bodies use in larger amounts. But zinc actually plays a mega-important role in skin health, immunity, and more, so it’s definitely worth keeping tabs on your intake. Luckily, it should be easy to get all the zinc you need—8 mg per day for women and 11 mg per day for men—through your diet, as long as you’re eating a variety of whole foods. 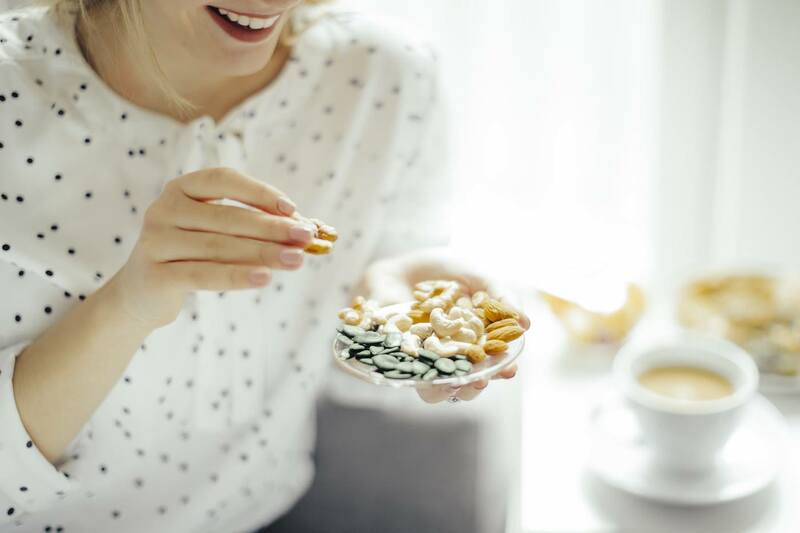 According to nutritionist Dawn Jackson Blatner, RDN, CSSD, animal protein and dairy are high in zinc, as are plant foods such as cashews, pumpkin seeds, chickpeas, and oatmeal. (Here’s a cheat-sheet of the best zinc sources to get you started.) But there’s one caveat. “Plant-based foods [like grains, legumes, nuts, and seeds] contain phytates, which may bind to zinc and make it less absorbable,” says Jackson Blatner. So if you’re vegan, vegetarian, or just don’t eat a ton of meat, you’ll just want to ensure you’re doubling down on zinc-rich foods, says Jackson Blatner—or take a multivitamin containing zinc if you’re concerned that your diet’s not doing the job. Follow those guidelines and you’re sure to revel in the many benefits of zinc, which are outlined here. Judging by this list, I’d say this lesser-known mineral is overdue for its own moment in the sun, no? 2. It can help heal skin—acne included: Jackson Blatner points out that zinc also plays a key role in wound healing—in fact, it’s involved with every stage of the process, from blood coagulation and inflammation to tissue renewal and scar formation. So if you find that it takes a while for cuts, scrapes, and burns to heal, you may want to take a look at your zinc intake. Some studies have also found that certain forms of the mineral can soothe breakouts when supplemented orally or as an ingredient in topical acne treatments—however, many of these studies had small sample sizes, so it’s best to talk with your dermatologist and see if this option’s right for you. 3. Zinc may help keep your vision healthy as you age: Several studies—including a randomized, placebo-controlled clinical trial of 3,597 people—found that supplementing with zinc can help protect against advanced age-related macular degeneration. This is a condition that can lead to vision loss, and it’s most common in those over 50. However, it’s unclear exactly what dose of zinc is most beneficial, or even if zinc alone has a significant impact, so talk to your doctor if you’re thinking about taking zinc for this purpose. 4. It could also help keep your breath fresher: Jackson Blatner says that dental products containing zinc might help reduce bad breath. One small randomized, controlled trial of 187 people found that a zinc toothpaste was more effective at combatting halitosis than a placebo, while an even smaller study of 10 people determined zinc mouthwash to be highly effective in eliminating the volatile sulfur compounds that cause bad breath. However, more research is required (on larger samples of people) to confirm this benefit. 5. It could help reduce inflammation: Some researchers believe that low zinc levels are associated with systemic inflammation, a condition that’s linked with everything from heart disease to cancer. One recent study showed that mice who received zinc supplementation showed lower levels of inflammation than a control group—however, more research needs to be done on humans before any definitive conclusions can be made. Are there any side effects to taking zinc? Jackson Blatner always recommends trying to reap zinc benefits (and those of every other vitamin and mineral) through whole-food sources, as opposed to relying on supplements to meet your nutritional needs. But, as mentioned before, there are some cases in which an added boost of the mineral could be helpful. “Someone could take extra zinc at the first sign of a cold to decrease the length of the cold and decrease severity of symptoms,” she says. “Plus, the need for zinc goes up during pregnancy to help with healthy cell growth, so that’s why zinc is in prenatal vitamins.” Your doctor may also recommend zinc supplements in certain situations, says Blatner—for instance, if you’re on blood-pressure medication that causes you to lose more zinc in your urine. To up your zinc game in the most delicious way possible, whip up this almond butter cashew banana cheesecake and these sweet-and-savory tahini overnight oats.